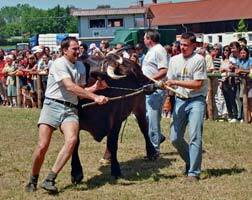 Ox racing takes place in rural areas of Bavaria in Germany. 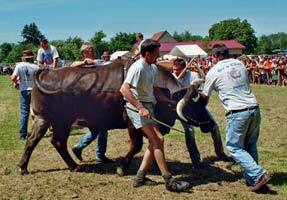 The oxen are raced in a roped off area of a field, with the start and finishing lines marked out. 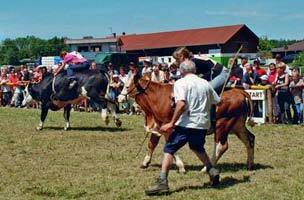 Each bullock is ridden by one person and is beaten by others to make it run. The whole thing is treated as a comedy, with the rider unable to have any control and on occasion sliding off. A great deal of stress is caused to the oxen by the beating and transporting them around the country. The people involved admit this and say that the animals get extremely loose bowels when they are loaded up for travel. We have made a number of complaints and due to our evidence a number of improvements have been made, e.g. veterinary officers have to be present and examine the animals prior to the race. In some instances sticks have been banned. Regulations on the restrictions of movement of animals for the prevention of the spread of diseases are now being enforced. This is resulting in a number of organisers not being able to continue because of the high costs involved.